Jamaal Peterman (b. 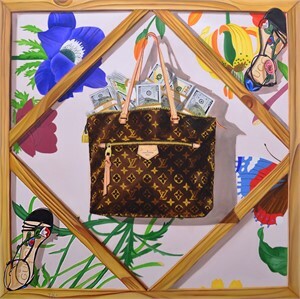 1990, Fort Lauderdale, Florida) is intrigued by the human obsession of accumulating luxury brands and its relation to social status and power in our modern lives. 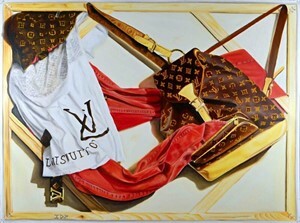 Depicting contemporary luxury designer products in the European oil painting technique of trompe l’oeil, Peterman brings into question the illusion of wealth and the cultural impact that popular brands have on the perception of an individual and how an individual perceives those around him/her. In a social media obsessed world, we are plagued with visuals of celebrities touting brands that have become synonymous with power and wealth. 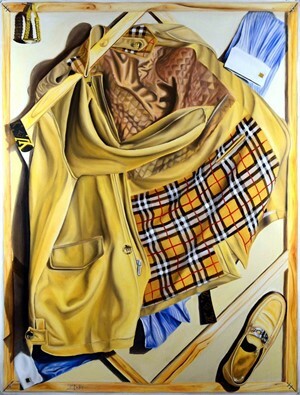 One associates an individual’s value and sense of identity through the objects one accumulates. 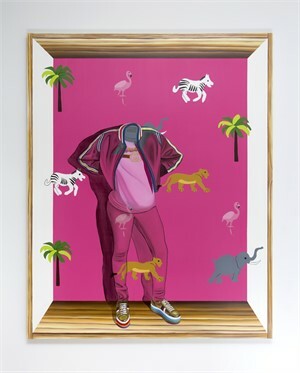 Peterman cleverly eliminates the human subject as a model, choosing to focus instead on the value of the material objects. 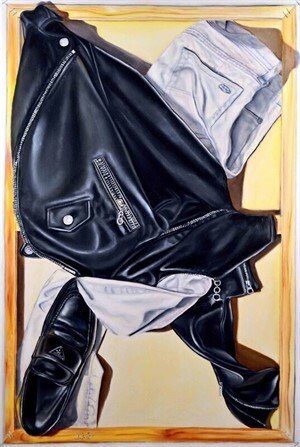 Employing hyper-realistic painting style, Peterman paints within the frame of his canvas uber-luxury fashion goods — his chosen symbol of all that is desirable. He shows that the individual judges his/her self-worth and status through another’s’ perception of oneself; associated more than often with consumerism. Furthermore, Peterman is creating a visual representation of that which is desirable at the current moment. Peterman shows how volatile the moment is — as representations of wealth changes swiftly and dramatically independent of the rationality. 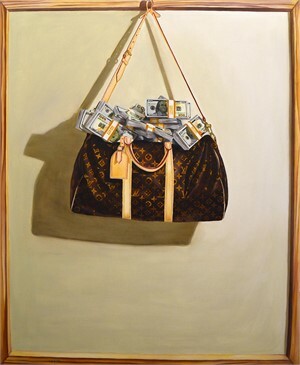 Framing the illusion of wealth that we hold within a physical canvas, Peterman brings into question the value of art concerning such objects. The result is that the viewer is forced to consider what is worth more; the objects in the canvas or the art created on the canvas itself? In this new series, Peterman touches on the scope of race, identity, value, gender, and social hierarchies. These silhouetted figures represent the physical and mental state of black bodies navigating throughout American history. From cultural displacement to systematic oppression, black physiques are continually on display. 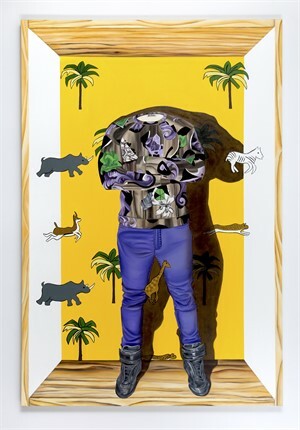 The figures are positioned in distinct dance poses, reflecting a sign of liberation and resistance from the restricted construct of a social framed network. A resident of D.C., Peterman graduated from the University of Maryland Eastern Shore with a B.A in Applied Design. 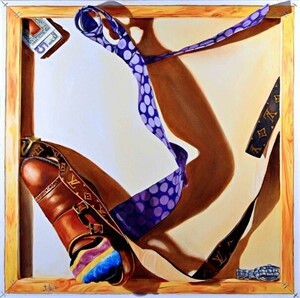 He is currently undertaking his Master of Fine Arts in Painting/Drawing at Pratt Institute. Jamaal Peterman (b. 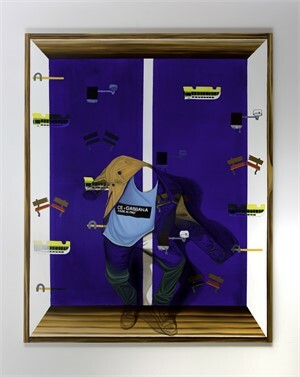 1990, Fort Lauderdale, Florida) is intrigued by the human obsession of accumulating luxury brands and its relation to social status and power in our modern lives. 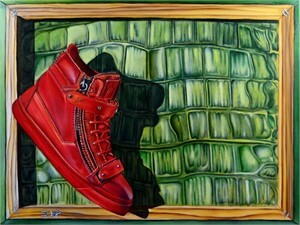 Depicting contemporary luxury designer products in the European oil painting technique of trompe l’oeil, Peterman brings into question the illusion of wealth and the cultural impact that popular brands have on the perception of an individual and how an individual perceives those around him/her. In a social media obsessed world, we are plagued with visuals of celebrities touting brands that have become synonymous with power and wealth. One associates an individual’s value and sense of identity through the objects one accumulates. 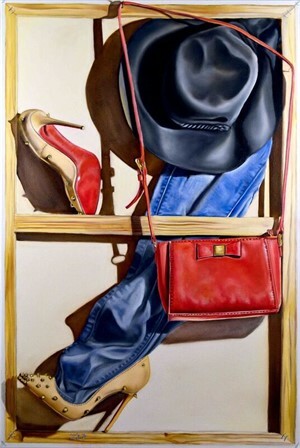 Peterman cleverly eliminates the human subject as a model, choosing to focus instead on the value of the material objects. 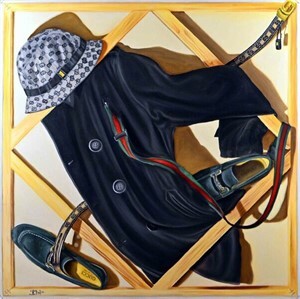 Employing hyper-realistic painting style, Peterman paints within the frame of his canvas uber-luxury fashion goods — his chosen symbol of all that is desirable. He shows that the individual judges his/her self-worth and status through another’s’ perception of oneself; associated more than often with consumerism. Furthermore, Peterman is creating a visual representation of that which is desirable at the current moment. Peterman shows how volatile the moment is — as representations of wealth changes swiftly and dramatically independent of the rationality. 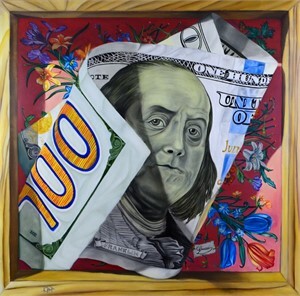 Framing the illusion of wealth that we hold within a physical canvas, Peterman brings into question the value of art concerning such objects. The result is that the viewer is forced to consider what is worth more; the objects in the canvas or the art created on the canvas itself? In this new series, Peterman touches on the scope of race, identity, value, gender, and social hierarchies. These silhouetted figures represent the physical and mental state of black bodies navigating throughout American history. From cultural displacement to systematic oppression, black physiques are continually on display. 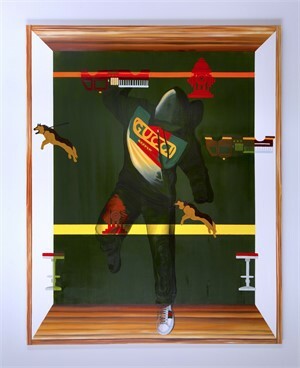 The figures are positioned in distinct dance poses, reflecting a sign of liberation and resistance from the restricted construct of a social framed network. “As young African Americans looking for inspiration and knowledge, we find ourselves looking at idols and tokens that are on display not realizing we are the ones being displayed. It’s hard to value cultural history as young black men when you are living in the most oppressed places and impoverished communities. Within these framed structures, I intend to evoke a sense of lateral movement through space and economic development with temporal moments of being on display that are restricted to move vertically or up the economic ladder. The backgrounds are a reference to a time in history when abstract expressionist color painters like Barnett Newman and Mark Rothko shot through the western canon. By using these modern master techniques, I want to understand the relationship between the moment these artists created new hierarchical social structures and what was happening with the African American diaspora during this pivotal time in history. 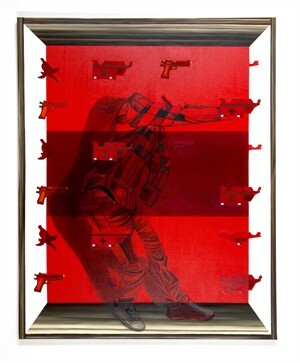 Through this juxtaposition, I used symbols and monograms that fade in and out of the painting as a remembrance to our social disposition and its relationship to our current political climate. “ Jamaal Peterman A resident of D.C., Peterman graduated from the University of Maryland Eastern Shore with a B.A in Applied Design. 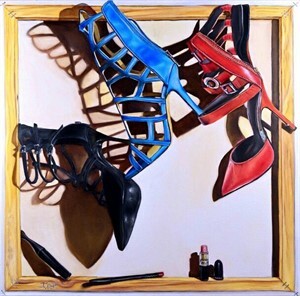 He is currently undertaking his Master of Fine Arts in Painting/Drawing at Pratt Institute.